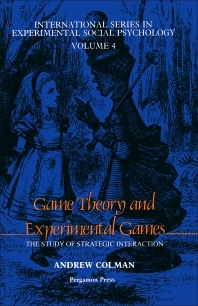 Game Theory and Experimental Games: The Study of Strategic Interaction is a critical survey of the essential ideas of game theory and the findings of empirical research on strategic interaction. Some experiments using lifelike simulations of familiar kinds of strategic interactions are presented, and applications of game theory to the study of voting, the theory of evolution, and moral philosophy are discussed. Comprised of 13 chapters, this volume begins with an informal definition of game theory and an outline of the types of social situations to which it applies. Games of skill, games of chance, and games of strategy are considered. Games of strategy are further subdivided into coordination, zero-sum, and mixed-motive varieties. Subsequent chapters deal with one-person games in which a solitary decision maker is pitted against Nature; the competitive nature of two-person, zero-sum games; the relationship between game theory and experimental games; and the mixed-motive character of variable-sum games that generate intrapersonal and interpersonal conflicts. Experiments with prisoner's dilemma as well as coalition, auction, and social dilemma games are also considered. Finally, some applications of game theory are described. This book is designed for advanced undergraduates, graduate students, and relevant practitioners in social psychology, sociology, economics, and politics, and in some cases for a rather broader public. 8.4 Harold Pinter's "The Caretaker"
11.8 Is Strategic Voting Unfair?